NOTE: This background page is under development, especially with reference to the "model". The author plans to publish further information about the theoretical and methodological approach taken in developing this archive. There are several databases on the major research pages of WHO, WHAT, WHERE, WHEN. Whenever citations are used, please link to the REFERENCES page for the publication or location of data. If permission was granted to the author for publication of these images then the provenience and museum is acknowledged appropriately. Otherwise the artifact is described as completely as possible or hand-drawn. Under the WHO research page there are two interconnected databases: AGENTS and ATTRIBUTES. As representative of an individual or a group, agents from the Middle Horizon are numbered from 100. The basic unit of analysis is the artifact. Each artifact is assigned an ìagentî number. Artifacts that represent the same agent are given a consecutive number following the agent number, for example: 100-1, 100-2, 100-3, etc. Cross-referencing links occur among agents, attributes and references but not to specific artifacts. 1. AGENTS: Each agent is represented by a description and composite sketch. If proveniences of artifacts are known, then a map is provided. Links allow navigating from one agent to another with similar attributes and to references for the published images of the agent. When describing the image of an agent, the left and right sides are the left and rights sides of the image. 2. ATTRIBUTES: The attributes of each agentís depiction are currently arranged into two design categories: posture and accessories. Due to the fragmentary nature of many artifacts some agent examples are based only on a few attributes. Artifacts must be large enough to provide diagnostic attributes. Future research may split or combine agents. Under the WHERE research page, archaeological site locations are located and any additional web-based reports or ongoing research of that particular site will be added. Under the WHEN research page, chronological data such as stylistic seriations and calibrated C-14 dates and AMS dates will be compiled with appropriate references. This website was initiated to provide a research tool to study artifactual depictions of "agents" on artifacts in order to further such anthropological goals as group/ethnic identity, social and behavioral interaction, political and religious roles, household and community dynamics that archaeologists seek to understand from data analysis. This website has recently been reorganized to compile a broader set of data and research references to meet these goals and go beyond just the "agent" to delve into an understanding of the "landscape" as a result of agency development. As Carl O. Sauer (1925) wrote in his "The Morphology of Landscape", "Culture is the agent, the natural area is the medium, the cultural landscape is the result. Under the influence of a given culture, itself changing through time, the landscape undergoes development, passing through phases, and probably reaching ultimately the end of its cycle of development. With the introduction of a different - that is an alien - culture, a rejuvenation of the cultural landscape sets in, or a new landscape is superimposed on remnants of an older one." Though I never met Dr. Sauer I did have the pleasure of interviewing his daughter when I wrote the biography of Isabel Kelly (Knobloch 1988). I learned from Kelly's work how insightful and sensitive was Dr. Sauer. Though she was a Kroeber student of anthropology in "South Hall" at Berkeley, she greatly preferred Sauer's company in "North Hall" and was, therefore, a witness to his early study of the interplay of the natural world and humanity as he created his new school of "cultural geography". As archaeologists, we build on this concept with research into the technological modifications of the landscape and the recorded impressions and expressions of ancient agents in their symbolic repertoire of styles. My study of ìthe individualî began with analyzing Huarpa style pottery (Knobloch 1976). I attempted to describe a model of interaction among Huarpa individuals who once occupied numerous sites in the Ayacucho-Huanta valley by recording obvious (e.g., vessel shape, paint color, geometric motifs) and less obvious (e.g., temper, rim and lip treatments, brush sizes) design attributes on pottery, respectively. Within a ceramic collection from one location, I argued that a sample of the collection possibly represented a single potterís work. Specialization was discerned by the homogeneity of obvious and less obvious ceramic attributes. In other words, an individual who specialized in making all of the ceramics would, to some degree, continually possess the same cultural or between group constraints and within group teachings.î(IBID.:122-123). 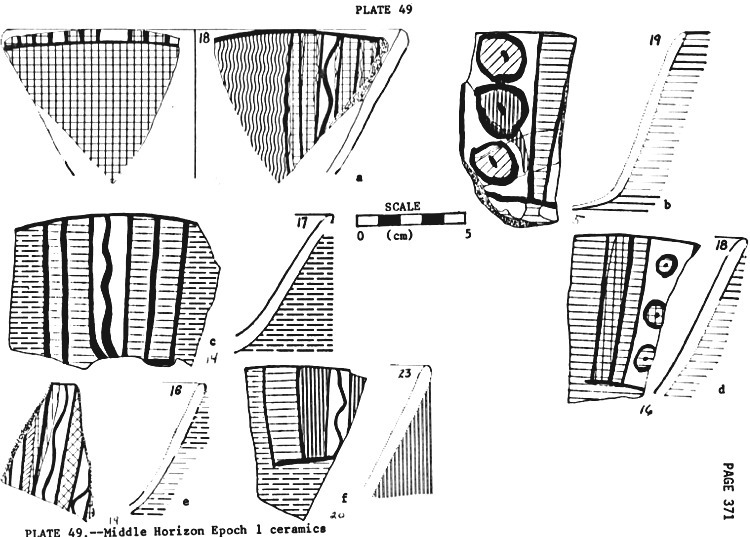 This interest in discerning evidence of individuals continued (Knobloch 1983) with the discovery of images of Huari individuals depicted on Epoch 1 pottery excavated at Huari in 1977. These images depicted Huari wearing chevron headbands and pendent rectangle designs on their cheeks. The headbands were also painted on large face-neck jars from a second Conchopata ìofrendaî that was salvaged during pipeline construction activity that same year. The chevron headband motif is also found on face-neck jars from Pachacamac that I was able to study at the Museum f¸r Vˆlkerkunde, Berlin in 1985. The pendent rectangle design also occurs on utilitarian pottery and its use may signify ethnic identity of individuals with their artifacts. Previously, Menzel drew attention to ceramic images of Huari people (1964:27-28, 49) in describing the Robles Moqo style (ftnt. 126, 131) and Atarco style with Robles Moqo features (ftnt. 294). Her descriptions refer to Agents 100, 105 and 106 in the current archive. Also, Valc·rcel (1935), provided excellent renditions of the many individuals carved from small turquoise stones found at Pikillaqta. He presented extensive comparisons to various cultural styles. He acknowledged at this early date that the figurines might represent individuals or be representative of group identity, such as tribes, within the area that the Inca ruled. There are also numerous references to Rosalind Spielvogel's 1955 dissertation. Not only is this impressive work an analysis of the Huari ceramic collection at Yale University (Bennett 1953), but a photographic compendium of Middle Horizon artifacts that were analyzed for cross-referencing cultural styles. Though not widely known and often difficult to borrow from Yale, I strongly encourage anyone interested in Middle Horizon archaeology to study her work. Her research covered many museum collections as well as unpublished images (e.g., Tello's 1942 Conchopata offering that includes a bodiless profile angel head). She described individuals and textile associations as well as religious iconography. She accomplished an extensive analysis of the geometric organization and possible chronological development of Huari textile designs. Her work provided an essential resource for the present archive. Their work inspired me to continue to collect imagery and analyze the possible social roles and ethnic identities of those who participated in the development of the complex Huari society. I indexed the images beginning with those depicted on the beautiful textile from Ica found by Max Uhle and housed at the Phoebe Apperson Hearst Museum of Anthropology at UC-Berkeley (Uhle 1913:Fig.4; Kaulicke 1998:262). I was able to publish a photo of this textile (Knobloch 1989). Therefore, the indexing of images by letters begins with A or Agent 100 on the left, then B, Agent 101 on the right. Agent 101 is distinguished by x's on his cheek. These x's cannot be discerned from any of the published photos. Fortunately I was able to study the textile at the Hearst Museum to discover the identity of B, Agent 101. I began with the larger images in the middle of the textile and labeled them alphabetically left to right, then across the top and bottom. The same textile is depicted by Menzel (1977) but the photo is reversed. On one textile from Ica, this individual is depicted three times and is central to a scene where the weaver documented the bi-partisan relationship of numerous individuals or ethnic groups. On the textile, the individual faces a full-bodied depiction of another individual; both are held at the top of their heads by standing, full-bodied Griffins. Perhaps the weaver was documenting a political event in which the supernatural power of the mythical Griffin animal was necessary to unify opposing social groups. The scene depicts a duality or a confrontation of Huari individuals. It is not too surprising to see this scene as a confrontation since the step-fret faced individual has early south coast origins at Pacheco and the distribution of images of the x-cheeked individual indicates highland origins. The textile may be documenting a bringing together of two Huari factions. The individuals are being forcefully held face-to-face by griffins, a powerful pan-Andean religious icon. The 1993 paper given at the 33rd annual meeting of the Institute of Andean Studies in which I discussed the spatial and temporal distribution of 5 Huari individuals that were best documented at that time by known artifacts. As usual, I made the paper available to colleagues for comment and have included it on this web site. I also sent the English version of the 1989 Japanese publication to colleagues of Middle Horizon Huari prehistory. In a 1999 SAA and 2000 IAS papers I elaborated further on the lettering of Huari individuals in diagramming their relationships to those on the Ica textile. The collection developed into the present archive that I hope will serve as a reference to identify individuals/groups as "agents" and contribute to the understanding of ethnic identity, social status, and relationships of the ancient people of the Middle Horizon. The largest corpus of imagery of "agents" is within the Moche portrait and fineline painting on pottery. The work of Donna McClelland in both her artistically exacting and detailed renditions as well as her insightful analysis and interpretation of the drawings has always been an inspiration to me in trying to bring the Huari culture alive. Christopher Donnan has taken the analysis of the such imagery to an interpretive level on par with what most historians attempt from written documentation and has interpreted 60 different themes in Moche art. Together their work will prove to be an exciting arena within which to compare the Huari images and to discern cultural relationships (Donnan and McClelland 1999; Donnan 2001), such as the sacrifice theme or presentation theme. Other agents from cultural areas such as central coast Pachacamac, south coast Nasca and south highland Tiwanaku, Pucara and San Pedro de Atacama, will be explored in future updates of this web site. With my other professional career as a librarian (MLS 1988, UC-Berkeley), I have a vested concern with providing reference tools to further and assist the research of this social science. I expect that various agents may eventually split into separate agent identifications or perhaps combine as design attributes are discovered and recorded. I plan to add more drawings of images that are not reproducible and obtain permission to publish photos to replace drawings. My hope is that this website becomes an ideal medium for continual updating and refinement in analyzing the "agents" of the Middle Horizon. 1953 Excavations at Wari, Ayacucho, Peru. Yale University Publications in Anthropology, Number 49. New Haven. 2001 Moche Ceramic Portraits. In Moche art and archaeology in ancient Peru, edited by Joanne Pillsbury, pp.127-139. National Gallery of Art, Washington. Yale University Press, New Haven. 1999 Moche fineline painting: Its evolution and its artists. UCLA Fowler Museum of Cultural History, Los Angeles. 1998	Max Uhle y el Peru antiguo. Fondo Editorial, Pontificia Universidad Catolica del Peru, Lima. 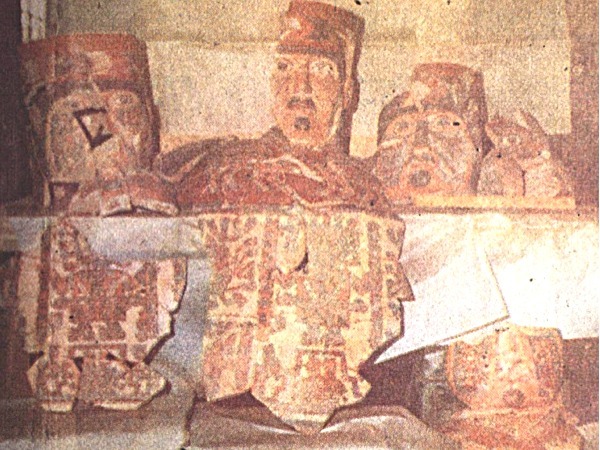 1976 A study of the Huarpa ceramic style of the Andean Early Intermediate Period. Unpublished M.A.Thesis, Department of Anthropology, State University of New York, Binghamton. 1983 A study of the Andean Huari ceramics from the Early Intermediate Period to the Middle Horizon Epoch 1. Unpublished Ph.D. Dissertation, Department of Anthropology, State University of New York, Binghamton. 1988 Isabel Truesdell Kelly. In Women Anthropologists: A biographical dictionary, edited by U. Gacs, A. Khan, J. McIntyre and R. Weinberg, pp. 175-180. Greenwood Press, New York. 1989 Artisans of the Realm. In	Kodai Andes Bijutsu (Ancient Art of the Andean World),	edited by S. Masuda and S. Shimada, pp. 27-45. Isanami Shoten, Publishers, Tokyo. 1993 Who was who in the Huari empire	WWWIAS93Paper.html	Paper presented at the 33rd Annual Meeting of the Institute of Andean Studies, Berkeley. 2000b Wari ritual power at Conchopata: An interpretation of Anadenanthera colubrina iconography. Latin American Antiquity	11(4):387-402. 1964 Style and time in the Middle Horizon. —awpa Pacha	2:1-106. 1977	The archaeology of ancient Peru and the work of Max Uhle. R. H. Lowie Museum of Anthropology, University of California, Berkeley. 1933 Esculturas de Pikillajta. Revista del Museo Nacional 2(1):21-45. This web site is considered intellectual property of the author and can be cited appropriately as copyrighted.